Secondly, and this is crucially important, individual action on its own, unaccompanied by other measures, may be almost worse than nothing. For instance, if our “avert planetary disaster” time budget is entirely used up in working on our own personal purity zero-carbon goal, with nothing left over for getting our pension fund to divest from fossil fuels, our efforts will be obviously terribly ineffective in terms of hours spent to carbon emissions averted. Another way to see it is in terms of “silent smugness”: if the outcome of engaging in individual low-carbon activities is to we feel that at least we’ve done our bit, and it’s not our problem anymore whether anyone else has done theirs, individual action becomes a way of disengaging from the larger problem. And, well, planetary catastrophes are a larger problem. That’s why the goal of this story is not just to tell you what you can do, but how: to insure a maximum social echo for your actions. 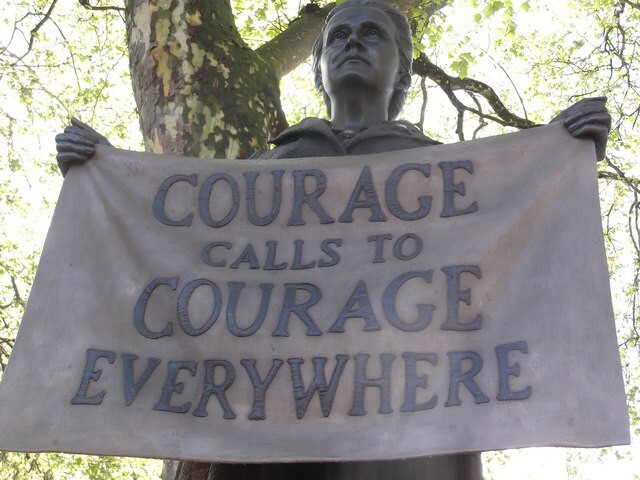 Millicent Garrett Fawcett detail, Parliament Square, London. Photograph by Robin Sones. “Humans are social animals, and we use social cues to recognize emergencies. People don’t spring into action just because they see smoke; they spring into action because they see others rushing in with water.” If we want our co-workers, family members, neighbors, businesses and politicians to understand there is a climate and living world emergency going on, we had better signal through our actions that we truly believe this emergency is real. Carrying an “End of the world is nigh!” sign while flying to conferences or on holidays to eat meat from animals fed on soybeans from Amazonian deforestation won’t fool anyone: it makes it obvious that you’re just pretending to care, but don’t actually truly believe for a single nanosecond that there is a real problem. “conservation behavior spreads across people. It’s not enough to tell people they should conserve; people have to see what others do.” People learn to change when they see others doing it: effectively, individual change is leading by example. It demonstrates to your co-workers, neighbors, family, etc that (a) this change is practically feasible; (b) people in their immediate circle are doing it (i.e. it’s not that weird); ( c) this is a direction the world might go in, so they should learn about it. I think the last point has been under-emphasized: people like to have awareness of new trends and horizons, especially for their health and well-being. So demonstrating a new “right” way of doing things is a topic of automatic curiosity and interest: Is this what we should all be doing? Can we learn how it is done? Can we try it out? And it only takes one person to start a trend. You may not see yourself as a fashion leader or trend-setter (like the kidz say, LOL, amirite? ), but you are inevitably part of a web of people who look to each other for cues, information and solutions. You can (and let’s face it, must) be the spark that illuminates a different way of doing things, a different way of being part the world, all across that web. This one is really big: once you are personally engaged in something, walking the walk, putting your body and actions in motion to advance this cause, you become braver and more willing to reach out to others to ask them to change too. In our individually-focused society, asking someone else to change is considered rude, a terrible taboo. And we feel it as such: we feel almost apologetic reminding others we eat plant-based food, or don’t fly or drive — never mind asking them to change as well! But climate breakdown and species extinction requires us to be bolder and braver, and here individual actions are the baby steps: once you have ordered your first veggie burger or committed to cycling to work, you are learning to stand in a new place. From that new place, you learn to expect more from others as well, and you can beckon them to join you. You learn to expect more from your politicians, in terms of action and infrastructure: less money for motorists, more for the rest of us. You learn to expect more from your workplace and pension fund. You expand the horizon of your possibilities and ambition, and this goes from strength to strength. Change is hard, sometimes. And despite the glib “you can just switch to X!” narrative, enacting the daily differences we believe are necessary to shift the world to a less disastrous course involves obstacles and setbacks. Making big, permanent changes on our own is in some sense too much to ask: we are asked to live and work within structures that are mainly designed for fossil fuel use. But we can try. And something very interesting happens when we try, even when we don’t succeed entirely the first time: we talk to people, we communicate, we trouble-shoot, we learn. So by asking questions, discussing difficulties, laughing over failed attempts at making veggie burgers, one individual will be learning from, and teaching others, what a carbon-free life can look like, and how it can be adapted to diverse situations: spread out. The usual propensity of people to disagree on details even when they agree on the bigger picture is particularly manifest in this sphere. But sadly, dear quarrelsome friends, you don’t get to choose. Remember? We’re in a both/and kind of world now. So this list is not prioritized: the only priority you get to make is which you choose to tackle first. If some of these need a longer plan to be realized, then that plan needs to be put in place so that you can get to a place where all of these are possible. As you read the list below, please be on the alert for your (our) own knack for self-justification. We are cognitively super-duper good at justifying our own unjustifiable and incoherent actions (all thanks to Clive Hamilton, whose excellent yet depressing “Requiem for a Species” first made me aware of this). How do you think that fossil-fuel company executives and war criminals sleep through the night and get themselves to work in the morning? Most humans are jiu-jitsu spin masters at contorting up excuses for ourselves, so we can keep functioning day-to-day. That little voice that says “It’s fine to fly to Thailand, because last week I cycled to work and today I had a mostly-vegetarian lunch, and anyway I’m a climate scientist. I’m the solution, not the problem!” — That voice? Practice becoming aware of it, and arguing back. This will help you understand and communicate kindly and effectively with others, as well as learn to have limited patience with your own shenanigans. Onward! That’s a big one. If you fly, air travel is certainly a large fraction of your personal emissions, probably anywhere upwards of a third. Not flying is one of the simplest, as in “single action”, as well as most impactful actions you can take. It also requires you to communicate with others (why are you not going to an exotic location on holiday? why are you not attending a conference which is relevant to your work? ), which is good, because only actions which are communicated ripple out. Not flying is also an action, unlike some others below, which requires obvious sacrifice. This is also good: according to Leor Hackel and Gregg Sparckman, actions which involve personal sacrifice remind us of our commitment, and make us more likely to engage in further advocacy. Professor Ingrid Robeyns’ tweet below encapsulates a lot of these issues, including dealing with family and professional expectations. But this communication itself, and bumping up against social norms (rather than acquiescing to them) is part of our challenging task. 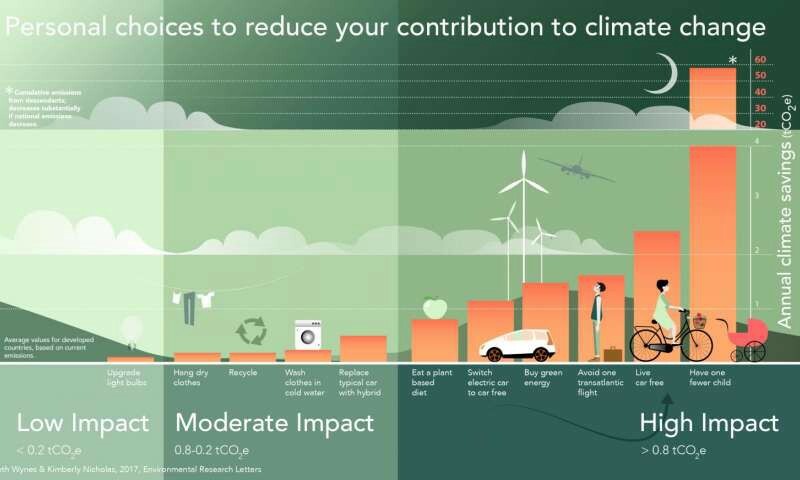 It should be noted that influence often works the other way: Greta Thunberg, the 15-year-old Swedish climate trailblazer, convinced her parents to stop flying, despite the impact on their careers, and Professor Robeyns followed her 9-year-old son’s lead in becoming vegetarian. What can you do instead of flying? Lots. Take the train or bus. Within Europe, Interrail tickets are now available to every age group, making long train distances more affordable. Demand virtual meetings and conference participation, or conferences with regional hubs connected virtually. Go on holiday closer by: the summer I couldn’t travel because of illness, we stayed in England and had a glorious time discovering nearby historical and natural gems. Cars are terrible. Seriously, I have NOTHING good to say about the invention of the internal combustion engine. Cars pollute, they kill people directly and indirectly, they are noisy, they take up space in cities, and they turn people into their worst selves. At the same time, they are also considered necessities of modern life: many people can’t envision their daily travel to work without a car, especially when that travel involves school runs, grocery shopping on top of other errands. I use cars for trips involving my elderly parents, or for weekend trips outside the city. Regardless of my personal feelings, though, not using a petrol or diesel car is one of the most effective ways you can reduce your carbon and land footprints. Did you know that a large fraction of the palm oil (driving massive deforestation and species loss, for instance in Indonesia) we use is for biofuel? Private transport is generally roughly a fifth of emissions, and given the immense health burden of air pollution in cities, a scandalous problem we are only currently learning more about, going car-free is one of the best ways to improve quality and quantity of life in your immediate community. 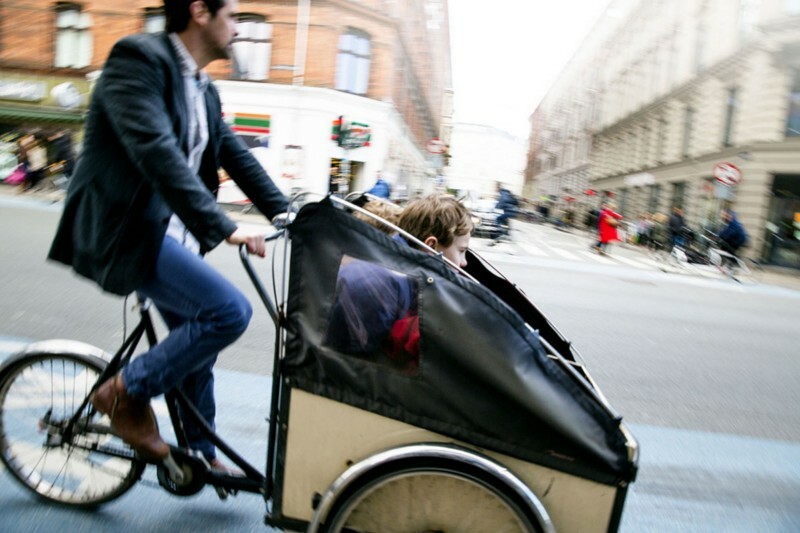 Father with children in cargo bike in Copenhagen. Source Wikepedia. What can you do instead of driving? Lots: public transportation might take longer (because of all those damn cars on the road! ), but allows you to relax, read or work while traveling. My favorite option these days, though, is electric bicycles, or e-bikes. They are relatively cheap (certainly compared to cars! ), can go at decent speeds (up to 40 km/hour for some models, which sounds honestly terrifying), allow you to travel longer distances and multiple trips without getting tired or sweaty, while exercising at a moderate level. If you have kids, cargo e-bikes are ideal for multiple trips (school runs, work, groceries …). I have many professional friends, such as architects or engineers, who work at multiple sites, buzzing around rain or shine on their e-bikes. I am currently in Geneva, pedaling around on my old non-e-bike, and happily amazed at all the older ladies in tailored suits sailing past me going uphill, and the cool mums & dads with their chattering offspring in cargo. Bicycling will also instantly turn you into an advocate for better urban planning, public transit policies and air quality, all of which are beneficial. Important disclaimer: disabled or less-abled people (like my elderly parents, for instance) obviously need motorized vehicles to get around, and their needs are dismissed when we make blanket statements that “everyone can just jump on a bicycle.” However, the order of priority here should be to first focus on accessible public spaces (car-free ones are great for this) & public transport. If a car or van are still necessary, these can be as small as possible and electric. The only message someone driving a bulky SUV is sending to the world is that they believe their status symbol is worth more than the lives of others: that they are not a good neighbor. This one doesn’t even involve sacrifice (as far as I’m concerned) and it can be done virtually overnight. Meat, fish and dairy products are some of the worse drivers of environmental devastation, through emissions of methane, emissions & pollution from animal waste, fertilizer use (for feed), and especially deforestation. They are also incredibly inefficient, since the bulk of meat and dairy production rely on grain-based feed: crops that are edible by humans, but where 1 calorie of red meat takes up to 10 calories of feed, and hence the same multiplier for land use, fertilizers & water. Food is one of the largest categories of emissions related to personal consumption: somewhere around 20–30%, and much more for land (and hence biodiversity) related impacts. Eating a plant-based diet has become ridiculously easy in many countries, with multiple 1–1 substitutes for milk, cheese, sausages, hamburgers, fish patties — you name it. Some large supermarkets are jumping on the bandwagon, and see plant-based diets as their industry’s future.And in the age of the internet, figuring out how to make vegan dishes which are tasty, fast, easy & cheap is possible for everyone. Again this individual action is both significant in terms of cutting emissions, and in terms of shifting and changing the discussion and norms around you. When you are invited to eat with others, you can insist on going to a restaurant with options for you beyond salad (most of them by now), and offer to bring a dish to share if you are eating at someone’s home (conversion through deliciousness!). Demand vegetarian catering at your workplace: this is now standard in many academic settings, for instance. An urban location is important because it enables the use of public transport and soft modes (bicycling & walking). People who live in cities often live in apartments or terraced houses: smaller spaces require less heating and cooling as well as less land. Urban lives often also allow us to benefit from immense public and cultural riches, experiencing, as George Monbiot called it, private sufficiency and public luxury. Frugal sufficiency means purposefully reducing our energy use and consumption within the home: heating to lower temperatures, purposefully not participating in consumerism. Insulating ones home and using more efficient light bulbs and appliances is important, and will make a difference, but on its own will likely lead to complacency and rebound effects (where the money saved on energy will be re-spent on other possibly more carbon-intensive items, like in Tesco’s now infamous “Turn Lights Into Flights” campaign). Of course, if possible, you should also install renewable generation in your home and workplace — but using less energy overall is not a bad place to start. These changes might be difficult for people who are used to shopping as a way of spending time, for instance. I would recommend connecting with public spaces and activities: associations organized around common interests, hobbies, activism, sports, arts, cultural activities, volunteering, craftivism and fixing stuff and so on. There are SO MANY more social and fun ways to spend time than to go to the shopping mall. And again, this is a way a low consumption home life can ripple out: by having more time and energy to participate in shared spheres. There are certainly other areas I have omitted, however none at a scale which is a significant chunk of individually-linked emissions, I believe. However, if the one you care most about it missing, please leave it in the comments? Remember, though: it should be significant, and it should ripple out. what emissions are included (carbon dioxide only, other greenhouse gases like methane and nitrous oxide, which others? …), does the study include land use change and deforestation as well as emissions? (This point is particularly important for studies on food and diets, where a large fraction of the global warming effect comes from non-carbon emissions and land-use change.). 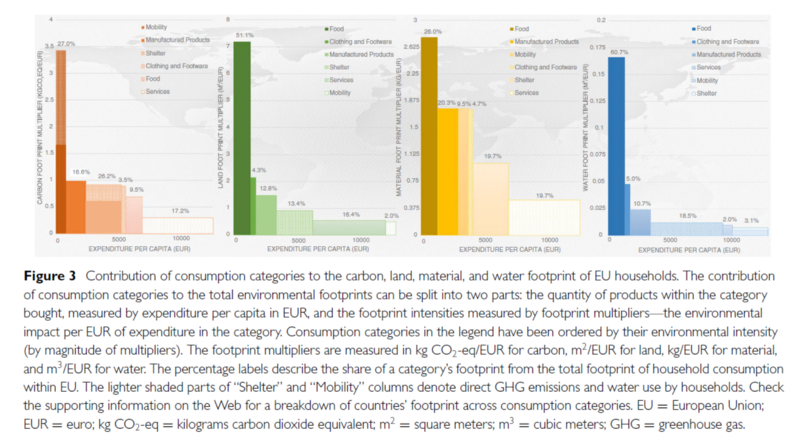 This study is fantastic in many ways: it compares multiple kinds of footprints (emissions, land use, water, materials), has global international coverage, and uses a consistent full accounting method throughout (no double counting). It probably represents the current gold standard. Figure 3 from Ivanova et al 2015, showing resource footprints for EU household consumption. “The Climate Mitigation Gap: Education and Government Recommendations vs. Effective Individual Actions” Wynes S and Nicholas K 2017 Environ. Res. Lett. 12 074024. Individual options to reduce climate impact from Wynes & Nicholas 2017. Post-Scriptum on children and population: Because this is likely to come up, the reason I didn’t include not having another child in this piece is NOT because I don’t think family planning, women’s emancipation and generally lower population levels are beneficial (I DO agree to all of those things). It’s because I generally agree with David Roberts in criticizing the original study (NOT Wynes & Nicholas’ excellent review) this number is based on, and on his broader reasons for not talking about population as a target “problem” in environmental issues. If someone has more questions on this, I’m probably going to recommend you go read Peter Staudenmaier and Janet Biehl’s excellent book on “Ecofascism”, so go read that too! Then I’ll be happy to talk. The Audacious Toolkit Climate Action Trilogy! This post is Part 3 of a trilogy! Part 1, covering the crucial importance of collective action, and A is for Advocacy, B is for Barricade and C is for Civil Disobedience is linked here. Part 2, covering becoming part of a movement, D is for Divest, E is for Election and L is for Lawsuit, is linked here. I’ll be writing something else soon, I think? On growth vs. sufficiency, on consumption and well-being and how they are not at all the same things. In the mean time, if you want to read some other stuff I wrote, on climate change, capitalism and democracy, see here?